1. First, you'll receive an invitation to be an administrator for the site. In the email will be a button to accept the invitation. Click that link. 2. Then, you'll be taken to a screen where you can either login if you already have a SquareSpace account, or create a new one. In all likelihood, you'll need to create a new one. 3. You'll need to enter your information. 3. Once you've entered your info, click the "Accept" button. 1. 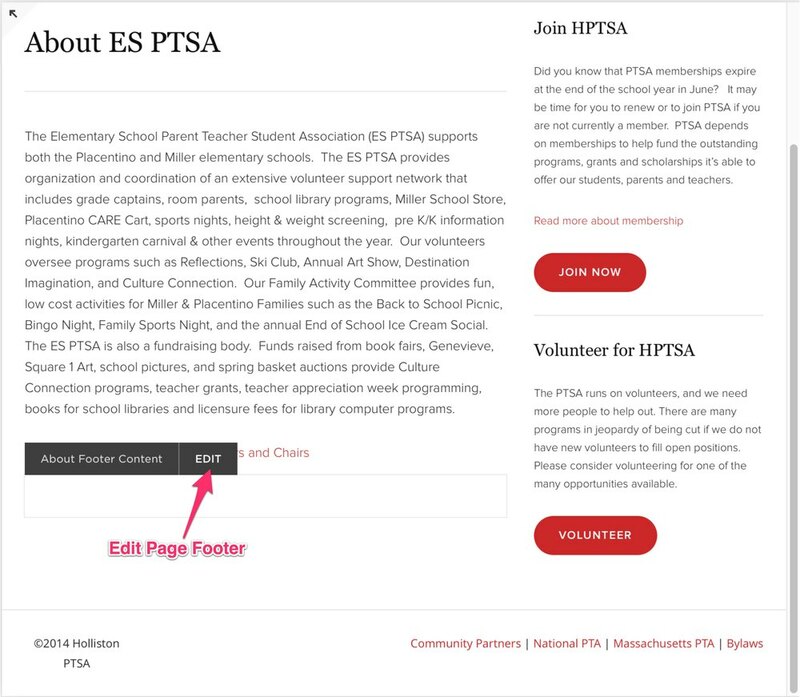 You're now logged in to hollistonptsa.org as an administrator and can do content updates. You'll see a preview of the site on the right, and the admin controls on the left. You can click around the site in the preview just as if you were a regular user looking at the site. All the links work. 2. You can also click the arrow in the upper left of the preview to hide the admin controls and see just the site. 3. If you do this, to get back, there will always be an arrow in the upper left to reveal the admin panel again. 4. While you can navigate the site just fine using the navigation links to get to the page you want, some pages are not present in the navigation. To see a full list of all pages on the site, including those that are not listed in the navigation, click "Pages." 5. Here you'll see a full representation of the structure of the site. You'll see that the "Sections" with multiple pages—Programs, for instance—are listed as folders with pages contained in them. 6. If you scroll all the way to the bottom you'll see a section called "Not linked." For the most part, these pages are still accessible to the outside world They are simply not represented in the primary navigation, but rather, are accessible either via their URL, or by links within other pages, or both (or neither). The page you're reading right now can be found in this section. Use the Pages section to find the page you want to edit. Once you've found the page, click it in the list and on the right in the preview you'll be taken to that page. 1. Once you've clicked the page you'd like to edit and it's visible in the preview, you'll see that as you roll over different sections with your cursor, a menu pops up. So, if you roll over the header for the page header, you'll see a menu pop up with a button to edit the header. 2. Similarly, if you roll over the page content, you'll see the same. 3. Likewise for the page footer. 4. To edit any of these sections (content for instance), just click the edit button for that section. The admin panel to the right will disappear and you'll see a new palette with two buttons: "Save" and "Cancel." Once you've made some changes, "Save" will save those changes, and "Canel" will exit editing without saving any of your changes. To actually make edits, simply click in any area you'd like to edit. 5. Once you've clicked to edit, you can type new content, select, delete or even paste in content from elsewhere just as if you were in a word processor. You'll also have a basic palette that will help you format. Most of this should be fairly self explanatory. An important note about pasting from either word processing documents or other web sites. If you just paste from a word processor right into SquareSpace, most of the styling from wherever you got the text will come along with it. THIS IS BAD. If you do this, part of the site you're creating or editing will look different from all the other parts of the site, and as much as you might like the styling where you got it from, I can almost guarantee, it will look bad in the site. And if people start doing this regularly, the site will very quickly start to look like an awful hodgepodge. I don't think you or anyone want that, and I know I don't. For these reasons, here are two methods to add text from elsewhere and strip out styling. 1. Once you're in Edit mode click to place your cursor where you'd like to insert the pasted text. In general, this method works much better where you're not pasting text right in the middle of a sentence or word. That is, it works better in a brand new text box, or at least where you're inserting between paragraphs. This example shows brand new text being pasted into a blank section. 2. Paste your text. You'll note that depending upon where you copied the text from, the font, size, line spacing and color may be poor matches for the existing site styles. 3. Select all the text you just pasted and then click the circle-with-a-line-through-it icon. 4. Doing so will strip out any style information from the text you just pasted and show the same text, but all matching the style for body text for the site. You can then use the built-in controls to change styles in a manner consistent with the available site styles. This would be the preferred method if you're pasting text in the midst of other text, but will work equally well no matter what the situation. 2. You'll get the "Paste as Plain Text" box. As its name suggests, it will take anything you paste into this box, strip out the formatting, and when you're done, paste it into the web page as plain text. 3. Click in the text box and paste your text there. After you've done that, click "OK."
4. Your text will be inserted as unformatted text right where your cursor was.